Blaney enjoyed a much better run than the last time the blue-and-white SKF Ford ran at Richmond. After starting in the Top 10, he held fast to the Top 20, then jumped to 11th for the restart on Lap 218. With 58 to go, he finally wrestled his way into 10th, made a pit stop before overtime, and snagged two more spots by the finish. It was Blaney’s best finish since Chicagoland, where he came home 4th, and improved on his 10th from the spring race on the Arizona oval. Next week, Blaney makes his second Cup start at Homestead, where he ran 17th in his 2015 track debut. Since 1998, Canadian driver D.J. Kennington had raced most every form of North American stock car racing. 26 starts in the X-1R Pro Cup, a Whelen Modified Tour start in 2011, eight in the K&N Pro Series West. He’s scored three CASCAR Series wins, 19 in the NASCAR Pinty’s Series, where he won the titles in 2010 and 2012. And this season, he’s made the most recent two of his 55 combined XFINITY and Truck Series starts. But until he picked up a ride Sunday with Premium Motorsports, he never made a Cup Series start. Kennington didn’t have a spectacular run, losing his first of eight laps on the 22nd circuit, but came home under power ahead of two other Open teams. As of this writing, who will drive the #98 and #55 at Homestead - and whether both will be entered at all - is still to be announced. 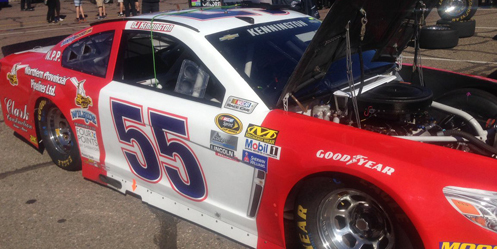 Sorenson arrived in Phoenix with a chance of securing his first-ever LASTCAR Cup Series Championship. A 40th-place finish on the oval would clinch the title. With Kennington in his #55, Sorenson moved over to the #98 Speed Stick Chevrolet, the team missing from the series since he last drove it at Kansas. He held 40th on Lap 9, but no longer, climbing ahead of several drivers who had trouble, including Jimmie Johnson and last-place finisher Martin Truex, Jr. Now, next week at Homestead, Sorenson is in a three-way title with Josh Wise (not entered) and Matt DiBenedetto to grab the title. Sorenson’s best finish in six Homestead races was a 16th in 2006 - he has never finished last there. Trailing the Open teams was Gray Gaulding, who returned to the #30 team for the first time since his Martinsville debut. Gaulding held 40th for most of the afternoon, at one time stalling coming out of pit road, and losing double-digit laps by the halfway mark. Still, he managed to stay out of the way of the leaders. Unfortunately, as at Martinsville, mechanical issues dropped him even further back. This time, the culprit was a fuel pump, which knocked him out in the race’s final moments. Gaulding returns with TMG next Sunday at Homestead, where he’s never raced in NASCAR’s top three divisions. None of the other part-time Open teams attempted the race in Phoenix.